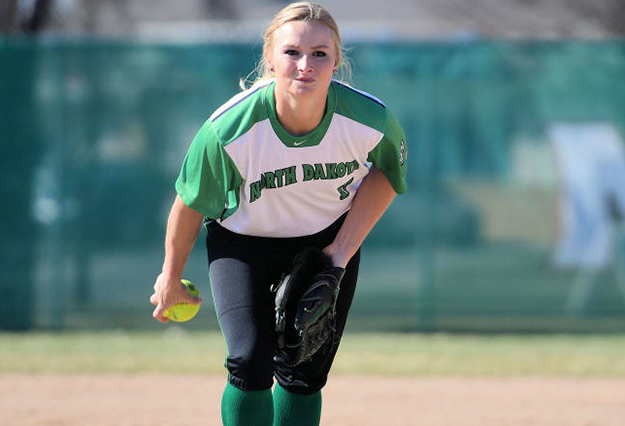 When she first arrived on campus in 2013, UND softball player and reigning Big Sky Conference Pitcher of the Year Kaylin VanDomelen didn’t know anyone else on the softball team. The Bend, Ore., native had never imagined ever living in North Dakota either. Photo by Connor Murphy/UND Today. 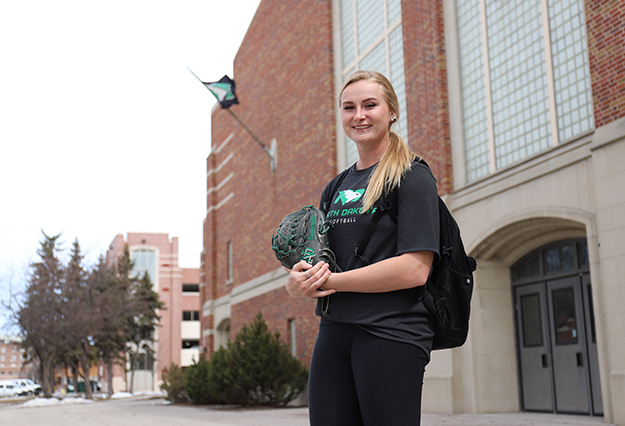 If you asked her, UND softball player Kaylin VanDomelen would tell you she lacks patience. But when it comes to teaching, the elementary education major has all the patience in the world. Her dream to work with kids goes back to when she would go to school with her mother. 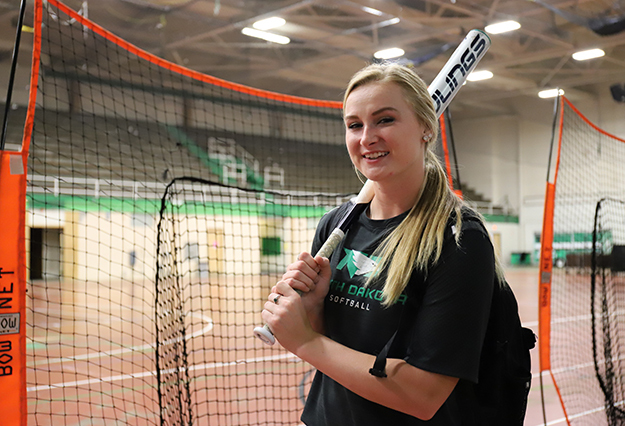 She expresses a similar level of determination regardless of topic, which translates to an outstanding career at UND on the softball diamond and in the classroom. In 2017, VanDomelen was selected Big Sky Conference’s Pitcher of the Year. This year, she’s already collected a league-best four Pitcher of the Week awards, including three consecutive honors (10 in her college career). She also has two no-hitters this season, and leads the Big Sky in strikeouts with 157. Image courtesy of North Dakota Athletics. At first, VanDomelen knew she could be content with staying in her native Banks, Ore. A three-sport athlete throughout high school, she was already being recruited to smaller schools in the region. 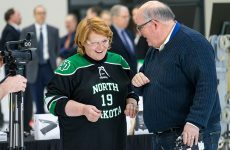 When she came to UND on a visit, the charm of campus proved the ultimate tipping point. She arrived on campus in 2013 not knowing anyone else on the softball team. She had never imagined ever living in North Dakota. In ways she didn’t expect, moving into collegiate competition was a culture shock. Since then, VanDomelen and the UND Women’s softball team have had a remarkable turnaround. Their overall record is hovering around .500 in 2018, and the redshirt senior pitcher feels like her culture shock turned to culture change. In 2017, VanDomelen was selected Big Sky Conference’s Pitcher of the Year. This year, she’s already collected a league-best four Pitcher of the Week awards, including three consecutive honors (10 in her college career). She also has two no-hitters this season, and leads the Big Sky in strikeouts with 157. Van Domelen also can be lethal with the bat. She’s amassed a career batting average over 300, with 156 hits, including 12 home runs. She says she’s learned to use that resiliency in her life and career as a student-athlete. Off the softball field, VanDomelen is in her fifth academic year in elementary education, with minors in special education and early childhood education. She’s constantly giving credit to the UND College of Education & Human Development’s supportive instructors for her success in the classroom. Photo by Connor Murphy/UND Today. VanDomelen is in her fifth academic year in elementary education, with minors in special education and early childhood education. She’s constantly giving credit to the College of Education and Human Development’s supportive instructors for her success in the classroom. Spring semester is a hectic time for the softball team. The Big Sky Conference matchups require an immense amount of travel, and long winters put home games on hold. VanDomelen experience with juggling academics with softball ball extends back to her stand-out high school days in Oregon. It’s that kind of experience that’s helped her offer advice to incoming teammates. This coming fall, VanDomelen will be participating in the UND Department of Teaching & Learning’s “Teaching and Education through Applied Methods” (TEAM) program. It serves as preparation for student teaching the following semester. She’ll be able to work with teachers on activities in all subjects and refine strategies before being in the classroom. She says growing up with a teacher as a mom taught her a lot about working with youngsters, and her high school had a teacher’s assistant program with the elementary school across the street. “I got to watch one of my favorite teachers at the time work with her first-grade class,” she said. 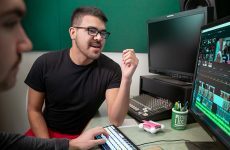 “I think UND’s professors have had so much time in the classroom that they aren’t just feeding you information. What they’re telling you is important for a reason, and it’s going to help you.